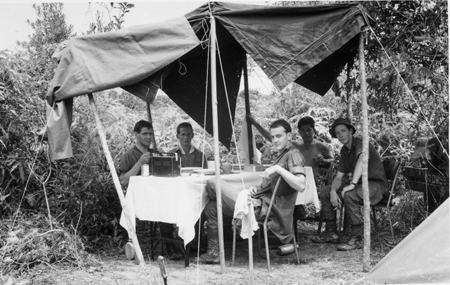 Land Forces (Australian, New Zealand and British, including the Gurkha's) operated in and around Malaya, Singapore, Brunei and Borneo throughout the 1950's and 1960's. We shall publish some of their stories on this page. 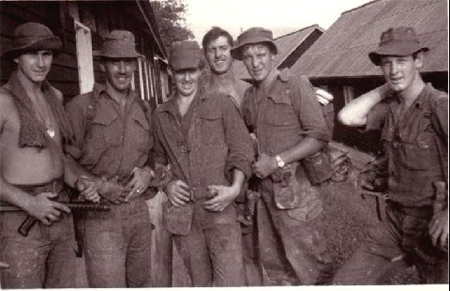 To start the ball rolling, here's a piccie of Keith Frape and some of his chums when serving in Malaysia in 1966. Keith, who supports our cause, now lives in South Carolina, USA. Here are some images from Barry Fleming's album. Unhappily, most of the photographs he took went AWOL from his fridge (explanation to follow!) while he and his wife and friends were out fishing for their supper (explanation to follow!). 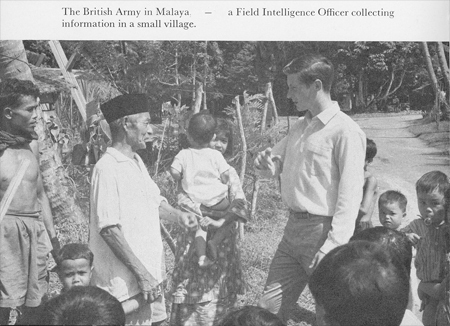 Barry - From J. Haswell's book "British Military Intelligence"
Tan Seng Bee, my tracker, interpreter, JCLO and friend. On his pit - I'm heading for mine! All this ... for a keepsake?!? Barry brewing up in more ways than one. 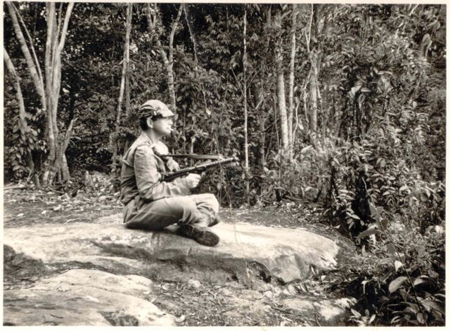 GerryL "[ex RAF Borneo veteran, holder and wearer of the GSM(1962) with clasps Malay Peninsula and Borneo, and soon to be holder and wearer of the PJM]" doing an 'informal' guard at a jungle range with the Kiwis. He (RAF) had been invited on a 'shoot' to enhance his skills with the SMG. Alert but contemplative. Here are four images of Paroi Camp sent in, and displayed courtesy of, Keith Frape - a PJMer and staunch supporter who now lives in the USA. 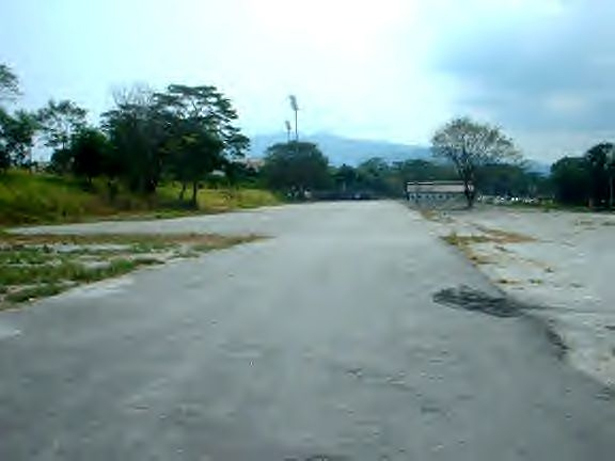 The same guardroom location spot last year, 2005. Visited by an ex Life Guard on a stop over from Australia and sent to me. 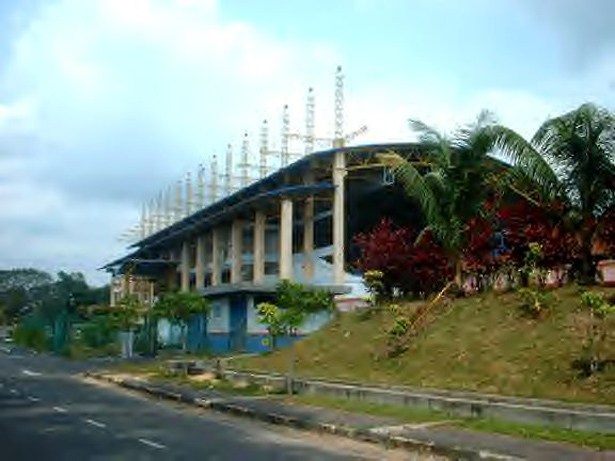 This sits at the top of the hill where the entrance to the vehicle park/area used to be. And this sits at the end of the runway on the old Football Pitch. This page contains images of a few of the Fight4thePJM campaign leaders. Here is another - the mysterious "mcdangle"! 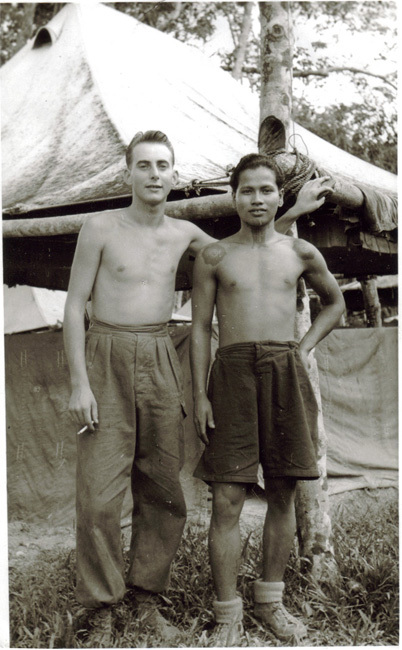 "mcdangle" and Andil (Iban tracker), B Company, 1 KOSB, at Niyor Rubber estate, near Kluang, circa July, 1956. 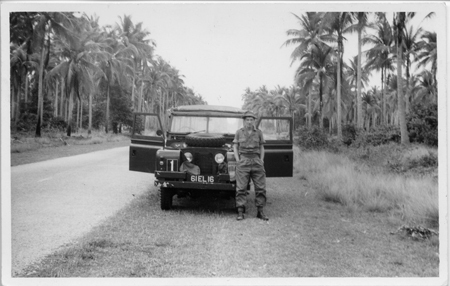 Photograph taken just before the Iban tracker's friend Dempi was killed in a CT ambush. Comment =Serving with recce troop 40Cdo (Oct 64/67,) meeting a lot of Commonwealth troops,in Malaya and Borneo,a run ashore in Kuching meeting up with a bunch of NZ SAS,asking us to transfer to them, and be a Kiwi,at the time we declined that offer,now I'm not sure if that was the right decision,any way too late now,(wear your PJM with pride guy's you deserve it) pity this Country does'nt think we do. I must say, to me personally, my time spent during the Confrontation were some of the best times I spent in the Corp's. 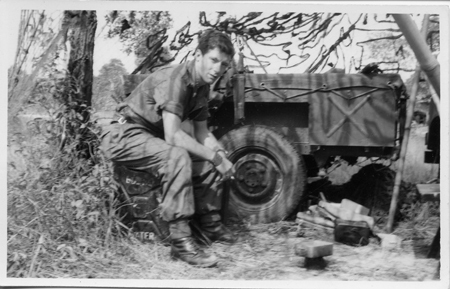 Ram Seager one of the best officers,if not the best I met in my career,Jungle War fare School in JB, Burma Camp,Para Course,Combat tracker Team,and of course Ice Cold Tiger Beer. Cheers to all the lads. It was a pleasure to serve with you all. The people who are refusing to lets us wear the PJM,probally wouldn't have lasted a week in the ulu, let alone 2 or 3 tours. Many thanks to the chopper pilots who picked us up, after a trip through the Gates,it was great to have a lift back. It was a shame some did not make it back, RIP. It was a war most of us were proud to Serve, Take note you decision makers in Tony's Goverment. Comment =I am in full support with your effort get this medal. I was in 16 Ind Para Bde Pro Unit RMP with 2Bn Para Regt in Borneo 1965 Att Sect Comm ... there were about 7 of us att., our CSM was Hq Coy CSM. Comment = Thanks Keith!!! 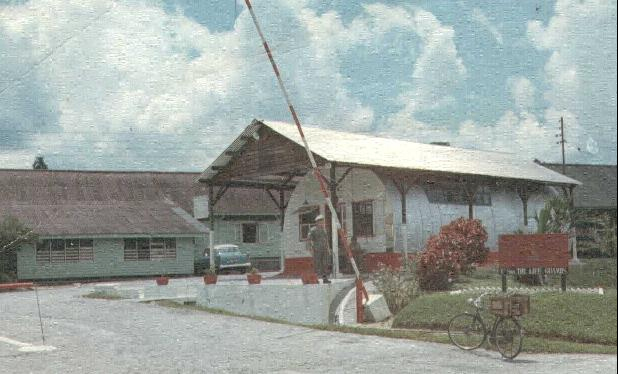 ....for the pictures of Paroi....I was resident there for a while (about 10 years prior to your stay it seems) as a member of 230 Signal Squadron....anyway, the photo' of the Guardhouse was most evocative...hadn't changed much in those intervening 10 years....and I recall the airstrip very well, with 2 little Austers perched at one end of it waiting for 'the off'...doesn't look like much, if anything, of the 'bashas' up the face of that steep hill has survived....maybe just as well. I always though that they were 'condemnable' when I lived in them! 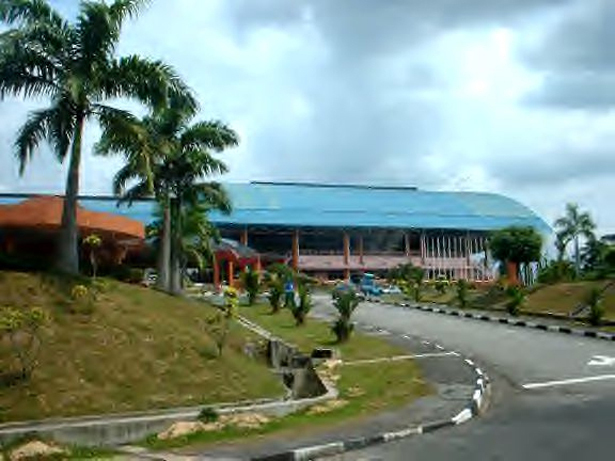 Comment = I was serving in Borneo when we last won the World cup. I hope we don't have to wait untill we win it again before I get my medal! Message=On one occasion we were operating a radio station whilst on 'ops'in Mersing.The Bedford 3 tonner had been left with us,so after a little thought we decided that to 'bashir up'in the ulu was out of the question so we slung our hammocks in the back of the wagon.All went well untill we got the order to PUFO.Time to dismantle the station,when we came to take down our diapole aerial we discovered a snake had wound its way round it so guess what??? ?Somewhere in the jungles of Mersing there is a radio aerial..and its MINE!!!!!!!!! 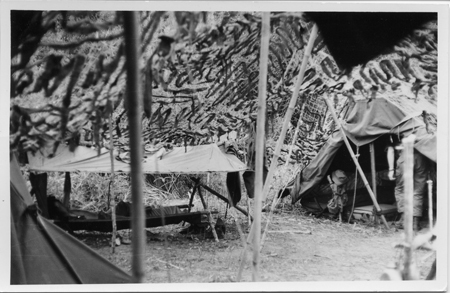 Message=On one occasion we flew 'up country' with a platoon of Ghurkas and headed up to Kuantan in Malaya. We flew from Changi in DC2's - the flight was known as 'Christmas Airways' as they had recently been transfered from there to Changi. As we approached Kuantan airstrip we had to climb over a range of mountains then, as the airstrip appeared below, the aircraft plummeted earthwards.The Ghurkas were on their knees praying! The poor lads thought their number was up. Suddenly the airstrip appeared before us and after a bumpy touchdown we landed to sighs of relief (in Ghurkali of course). We got the gist of it! This airstrip had been cut to bisect an old Japanese WW2 landing strip,the only way the pilot could land us safely was to climb the aircraft then DROP!! 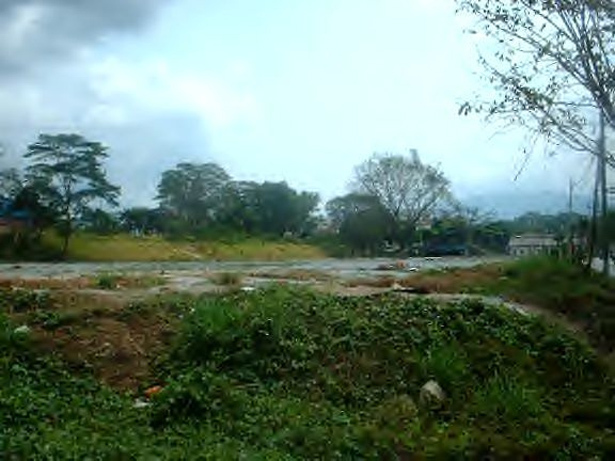 Message=Nice to see Paroi Camp getting a bit of space. 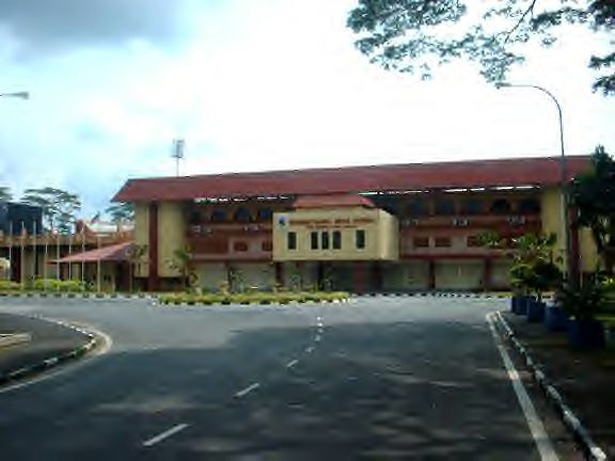 I served there with Seremban Troop, Mar1958 -Feb1959, worked in the COMCEN at Rasha Camp.